The special footpiece utilizes durable rivets to secure the aluminum tubing from the inside, providing more stability than plastic connectors. Long, virtually unbreakable stair deflector helps protect against the crutch slipping on stairs and helps increase stress tolerance at all angles without cracking; non-skid rubber tips provide good traction. Built-in metal ring helps prevent excessive wear and ensures maximum durability. Crutches come packaged completely accessorized with no assembly required. 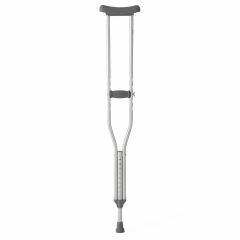 AllegroMedical.com presents The Standard Aluminum Crutches. Standard aluminum push-button crutches feature a double extruded center tube that provides load-bearing strength where it's needed the most. The special footpiece utilizes durable rivets to secure the aluminum tubing from the inside, providing more stability than plastic connectors. Long, virtually unbreakable stair deflector helps protect against the crutch slipping on stairs and helps increase stress tolerance at all angles without cracking; non-skid rubber tips provide good traction. Built-in metal ring helps prevent excessive wear and ensures maximum durability. Crutches come packaged completely accessorized with no assembly required.